Nothing is compared to the taste of grilled meat. When the weather is getting hotter or cooler, it’s time to chill & grill! If your old grill got out of order, you must look for an upgrade. 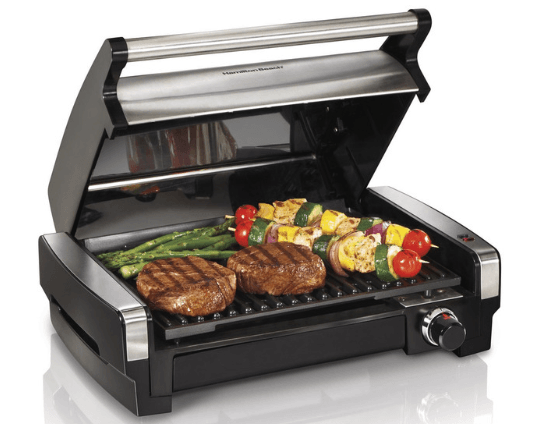 Modern grill models are designed with multiple features to cook the eat and assorted vegetables correctly. The three main things that describe the grill are performance, reliability, and design. A searing grill is something that makes everything amazing! Searing meat gives you a tenderized meat infused with your favorite flavors. The searing grill is a type of grill used to sear the meat. Searing is a technique where meat is baked till the surface gets cooked at high temperatures and the crust is caramelized perfectly. If you truly searching for the best searing grills, you are in the right place. 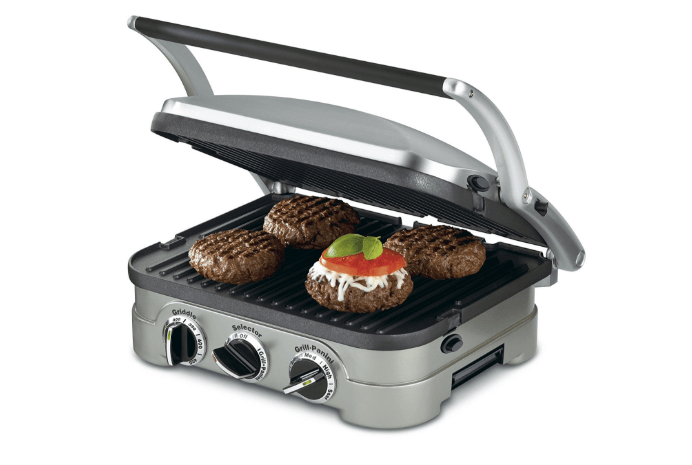 Hamilton Beach Searing Grills is one of the best indoor grills that fit perfectly for your Culinary skills. Drawbacks: What you should consider? 3. High searing temp ranges. 1. It doesn’t get hot faster. 2. Power cord is too short. Read more Complains and Flaws. 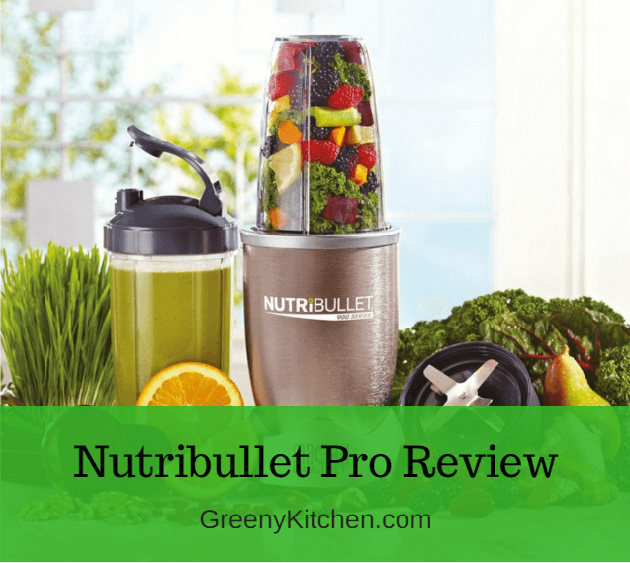 It's an obvious thing that before buying anything related to kitchen accessories, you do a lot of research to pick the right one. In the process of selecting searing grills, we have checked and tested different models and types of grills available in the current marketplace. After testing this product (Hamilton beach searing grill) for its performance and durability, we are pretty sure that, this is the best searing grill for you. It is an ideal grill which provides maximum heat to bring out the juicy and crusty texture to the meat. Working on the best searing grills increases your skills and also enhances the taste of food. The main reason people buys searing grill is, its high temperatures. The searing process needs high heat ranges to cook the meat evenly. Heat tenderize the meat and cooks the skin with sharp flavors. While choosing the grill, you should check the temperature ranges and controls to avoid uncooked meat. The Hamilton beach searing grill has a high heating capacity to idealize the searing process. It reaches the maximum temperature of 450 degrees when the green preheat light starts glowing. Then you can place the steaks, pork chops, fish fillets, chicken to sear with perfection. You can also adjust the temperature if you want to grill the food on lower heat. You can cook all types of meat, vegetables, and other seasoning elements. The temperature ranges serve you according to your needs. Steak, chicken needs low temperature when compared to pork and other meat. You can grill the meat, fish, steak, hamburgers and all types of barbecue food items with 11 different temperature settings. Grilling typically is done on the high temperature to cook the skin and boil the crust parts. Vegetables need low heat. so; you need a grill that has different temperature controls. Hamilton Searing grill heats up first to cook the meat first and cools down to give a finishing touch. Grilling surface defines the capacity of the grill. If you want to cook for a lot of servings, you should consider this searing grill. It is designed with 118 square inches (9×13) nonstick grilling surface that can accommodate up to eight servings. The grilling surface is large enough to cook food for 2-3 people at a time or three bone steaks or four burgers at once. It is big enough to hold meat and vegetables at the same time. Also, the nonstick surface does not get burned quickly and is easy to wash. It is easy to eat food but tough to wash the dishes. After a long day, everyone gets tired of scrubbing the grill and rinsing the plates. 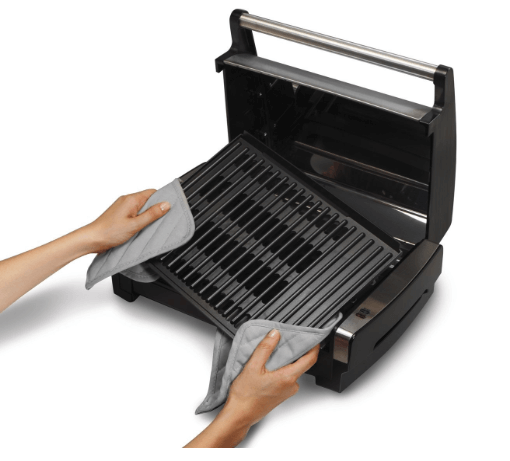 Hamilton beach searing grill is designed with removable hood and nonstick cooking grids that can be taken out and washable in the dishwasher. Also, it consists of a drip tray to collect the extra juices to keep your cooking place clean. The counter top grill has different heat settings and enough place to grill hot dogs, hamburgers, tuna and more tender meats. It consists of a removable hood, a plate, a extra -large drip tray. It has removable nonstick plates and preheated light indicators for user's comfort. It gives the same savor as the outdoor grills as the interior has specialized features. The grilling plate consists of heating which helps in grilling the food with the help of standard household current supplied from the corded base. It locks the spicy flavors deep inside the meat and caramelizes the whole dish. It takes 10 minutes to reach the high sear temperature, and the drip tray holds up the dripping juices in the process of cooking. Drip tray for hassle free clean up after cooking. It has a comfortable stainless handle and finishes lid hooks on the back side of the design which keeps the lid in secured place in open position. It has 24 inches attached power cord for secure electrical supply. 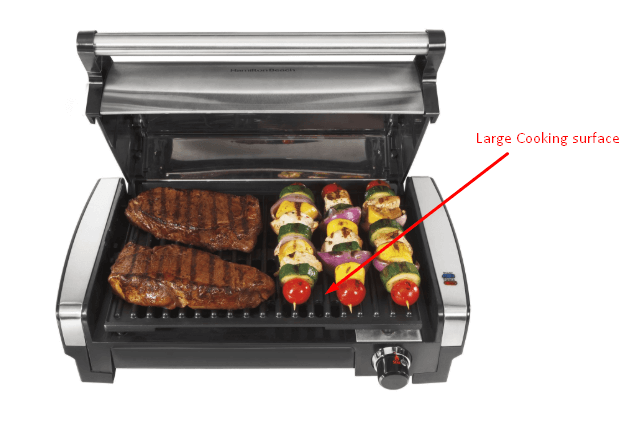 The grill surface measure up to 12-1/2 inches wide and 9-1/4 inches deep which provides good grilling space. Now Let’s focus on it's drawbacks. Honestly, we didn't get any serious kind of technical flaws, or design shortcomings of this unit in our own research. 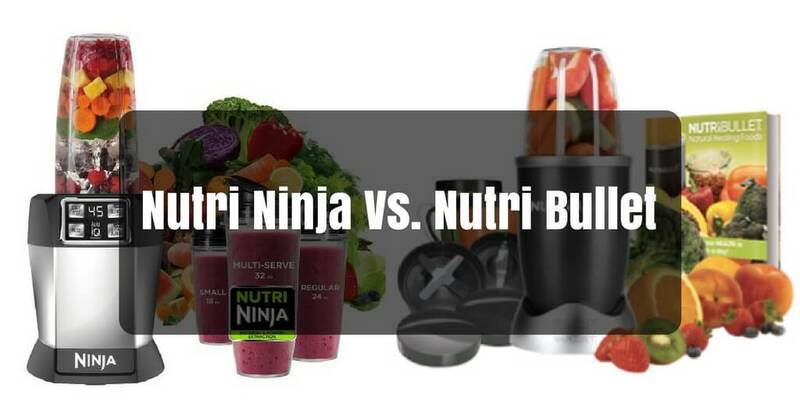 We know this fact that, the end-users are the "best reviewer" of any product or service. So, we analyzed 150+ user's reviews from all major e-commerce sites, forums & product review sites. After analyzing the reviews (both positives & negatives) we found that, more than 80% of users are highly satisfied with this Grill unit. And the rest 20% are not fully convinced with the product for some common issues. Although the issues are minor and one can easily resolve them, but I think you should consider them still. The power cord is not long enough. You might need an extension cord to use it outside of your kitchen. The Grill takes awhile to fully warm up. But, to get an authentic outdoor grill experience, you should give it time for preheating. As you can see that, the issues are not so serious. Therefore, I believe that you can select this searing grill without worrying about it's drawbacks. Still, Confused? Want some more info to make your selection process more comfortable? Then read our experts written buying guide below. Before investing in a searing grill, you should consider some factors that ensure the functionality of the grill. Here are some of the best qualities of high-quality searing grills. Materials used in the making: Searing grills are made up of metals like stainless steel, aluminum, and steel alloys. Modern grilling machines are designed with perfect finishing touch to give a fantastic outlook. Design: The searing grill should be firm and sturdy to last for a long time. It must be constructed with all the features that are user-friendly and simple to use. It should be easy to carry, the controls should be precise and the light indicators should provide useful information. The parts should be easy to assemble, and the removable parts should be well designed. It is necessary to take your searing grill everywhere with you to use it anywhere you want. So, consider the weight of a grill before making a purchase decision. Generally, a grill should not be more than 8.5 pounds. The Hamilton beach searing grill has a fit body. It weighs just 8 pounds. It has comfortable carry handles on both sides to hold it safely and move it around. As it is an electrical device, be careful when you are carrying it around, and you can use this device in balcony, kitchen, hall and everywhere inside your home. Electrical grills have multiple numbers of uses, and latest models are designed with innovative technology which results in enhanced performance and improved culinary experiences. These gills help you to learn more cooking skills and the temperatures can reach up to 700 degrees. You can cook restaurant-style food at your home with simple steps. Take note of what you are going to grill and also how frequently you are going to use the electric grill. If you are a party buddy and uses the grill every weekend, choose the one that has a rigid body that withstands frequent usage. A brand is a thing to consider when it comes to kitchen accessories because, it tells a lot about the products. "Hamilton Beach" is one of the famous brands manufacturing high-quality products for a long time. They design their products with most innovative and modern features which are user-friendly. A little care and maintenance can increase the lifetime of the Grill. Here are some of the tips for taking care of your searing grill. 1. As it is an indoor and electrical grill, do not use it outdoors and especially in rough weather conditions. 2. Use olive oil instead of cooking oil to protect the grill when making any recipe. 3. Put it in the dishwasher after every use to keep it clean. 4. Avoid water spells on the electrical parts of the device. Q: How many people can we serve in one use? Ans: You can serve two to three people as you can grill 8 servings. Q: How many modes of temperatures it has? Ans: It consists of 11 different temperature settings. 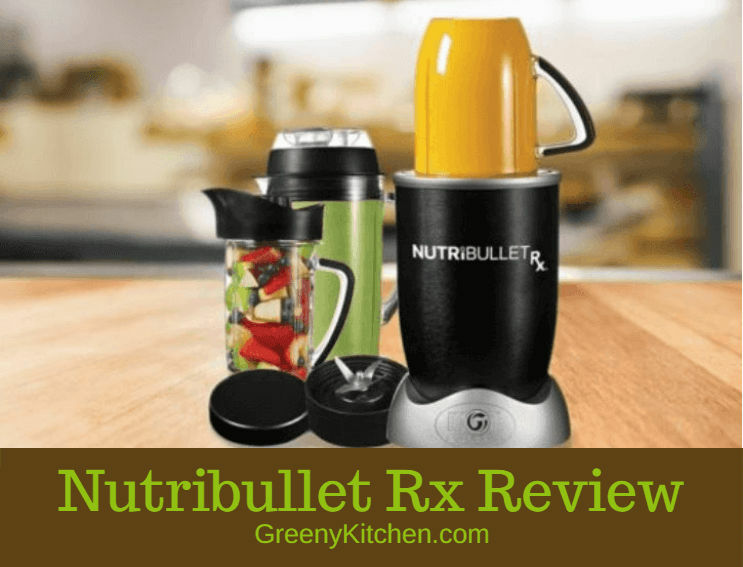 You can use it for various types of food recipes. Ans: It is 1200 watts. 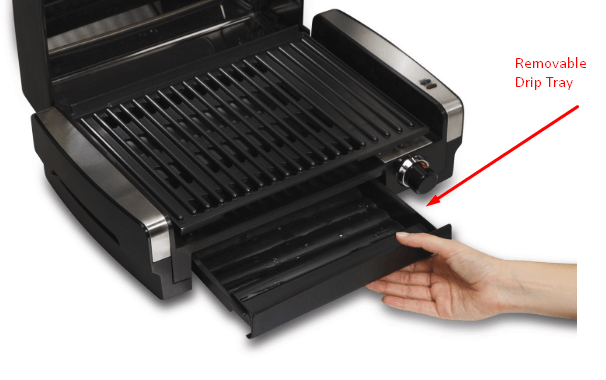 Be careful during the selection of Hamilton Beach Searing Grill and check all the points given in our expert buying guides. Enjoy the tenderized meat with seasonings seared on high temperatures. Watch how the meat gets turned into beautiful golden color and the crust gets caramelized. 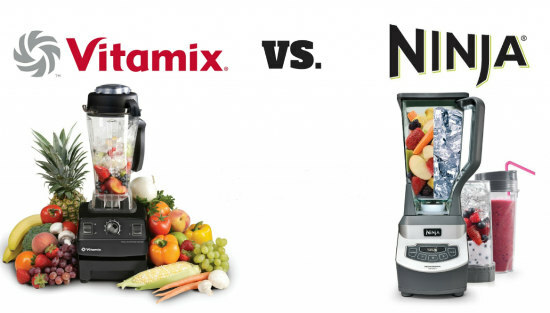 Do not compromise your needs when it comes to kitchen appliances and always invest in high-quality products that make them last for a long time.